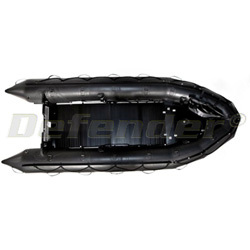 Well known throughout the world as the definitive Special Forces Boat, the FC range is used by more elite soldiers and sailors than any other craft worldwide. It is the only craft of its type that has actually been used in combat in different theatres and comes thru with flying colors. This is a result of its unique patented hull shape and various Floor systems that allows it to carry combatants in a variety of missions. The hull shape is especially important as it can get a large load on plane as well as give the driver unsurpassed maneuverability in different and often dangerous conditions. The Zodiac MilPro Futura Commando is the most recognizable military Boat.